After he had registered as a conscientious objector shortly before the second world war, Frank Newman Turner (FNT) was appointed as the manager of Goosegreen Farm at the foot of the Chilton Polden Hills on the edge of the Somerset Levels. He moved there with his wife, Lorna, and infant son in 1941. Goosegreen was a mixed arable farm of 180 acres to which COs were detailed to undertake land work. Apart from a small team of farmhands, whose labour was supplemented by land girls and the COs, German and Italian prisoners-of-war were brought in by lorry at busy times, such as harvest, to help on the farm. Because of constraints imposed by his landlords FNT was obliged to continue to run the farm on conventional lines resulting in declining health of both livestock and land which was proving to be uneconomical. It was not until he was able to rent and eventually buy the farm that he was able to start applying organic principles. 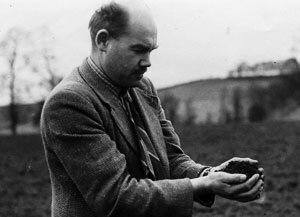 In 1943 he was able to set about restoring the health of the soil and the herd. As these improved Sir Albert Howard, who had visited Goosegreen and followed its progress closely, advised FNT to purchase the freehold. It would, he said, be foolish to build the fertility of the soil and the health of the stock for the benefit of the owners who were indifferent to its success. With the application of organic principles Goosegreen was returned to healthy productivity. Deep rooting herbal leys provided an abundance of trace elements and other nutrients that had been depleted by a policy of monoculture and chemical exploitation of the soil. The cattle, whose health and immunity had been compromised partly by deficiencies and poor grazing pastures, regained their vitality and productivity. The plough became redundant as soil structure improved and became more resilient to the vicissitudes of the weather. FNT’s herd of pedigree Jersey cattle achieved record butterfat yields (these were the days before butterfat became a health taboo!) and some, including the main herd bull, Top Sergente, became champions and prize winners at many West Country agricultural shows. By the application of nature cure principles such as fasting, enemas, and dosing with herbal infusions from plants grown on the farm, cattle which had been condemned to slaughter recovered to lead healthy productive lives in the herd. FNT even purchased cattle which had been recommend for slaughter owing to positive TB tests and other illnesses and nursed them back to health. FNT turned them to good use on the farm as forage for cattle and material for composting and described in his books how to do this to the best advantage of the farm. A spirit of semi-peaceful co-existence was instilled in which rooks were deterred from drilled fields by bangers in oil drums and a scarecrow or two. Many reform-minded people visited Goosegreen in the late 40s and early 50s. Some of them attended a series of weekend courses run by the Institute of Organic Husbandry which FNT had established to promote education in sustainable agriculture. Attendees were given practical instruction in haymaking with tripods, silage-making, composting, and the finer points of cattle care. A M Hogwood, who ran a health food store in nearby Bridgewater, and was a beekeeper, gave instructions in apiculture and pruning. At the end of the day’s talks and demonstrations delegates assembled on the lawn in front of the farmhouse, where Lorna served tea and home-baked scones made with stone-ground wholemeal flour. FNT’s writing skills, honed in his contributions to farming journals such as Farmer’s Weekly and The Farmer and Stock Breeder, were put to good use when he launched The Farmer, a quarterly magazine devoted to promoting organic husbandry and natural health. 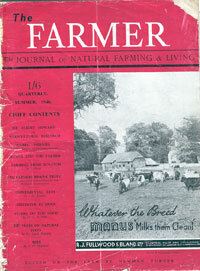 The Farmer ‘edited and published from the farm’ enjoyed a world-wide readership. It contained a diverse range of articles including a section called ‘The Farmer’s Wife’ (in which Lorna extolled the virtues of nettles and dandelions among other wild plants in her vegetarian recipes) and features on human health by Dr Cyril Pink, who had run Stonefield Maternity Home specialising in natural childbirth (and under whose care both Frank’s and Lorna’s younger two sons were born). Among other contributors were such leading figures in the organic and food-reform world as Sir Albert Howard, Friend Sykes, Doris Grant, and Richard St Barbe Baker, who founded Men of the Trees. One initiative that FNT established through the medium of The Farmer was The Whole Food Society (possibly the first use of the term ‘whole food’). Its aims were to put producers of naturally grown foods in touch with consumers to their mutual benefit. The Farmer was published until 1957. At a birthday luncheon in London to celebrate its 10th anniversary in 1956, FNT described some of the difficulties of publishinga magazine with limited revenue from advertising. The major farming press could be less scrupulous about accepting advertising from the agrichemical business. 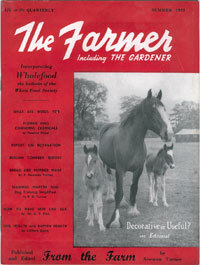 Newman Turner Publications continued with other magazines promoting the organic and natural living ethos, firstly The Gardener, a monthly magazine which had been a sub-section of The Farmer. The associate editors of this were W E Shewell Cooper and Lawrence D Hills. FNT also took on editorship of the magazine of the National Institute of Medical Herbalists and re-issued this as Fitness and Health from Herbs. Among the visitors to Goosegreen Farm were Victor Bonham-Carter and Richard de la Mare who were directors of the publishers Faber & Faber. Richard de la Mare was responsible for their agricultural list and one of their readers was Lawrence D Hills, who was himself a celebrated alpinist. They encouraged FNT to write about his experiments at Goosegreen and describe his methods of farming and animal husbandry. Before he died in 1947 Sir Albert Howard had also urged FNT to write about his work, but he was reluctant to do this before he had tangible results of its success. In 1950 he had published, through The Farmer publications, Cure Your Own Cattle, which was a slim volume of guidance on the natural treatment of cattle diseases with herbs and fasting. 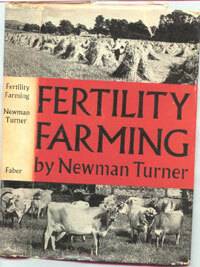 Faber & Faber published his first full-length book, Fertility Farming, in 1951 and this was followed by Herdsmanship (1952) and Fertility Pastures (1955). More than 50 years after their publication these books are regarded as classics of organic literature for their clear exposition of the principles and practice of sustainable agriculture. New editions of all four books have recently been published by Acres USA (www.acresusa.com) making them available to a new generation of farmers and stockbreeders. 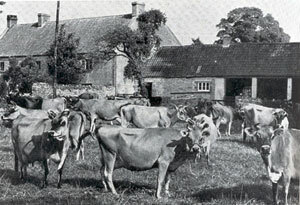 In 1953 FNT moved with his family and pedigree Jersey herd to the Ferne Estate near Shaftesbury on the borders of Dorset and Wiltshire. Ferne had been the home of the late Duchess of Hamilton and she had established an animal sanctuary there. The intention was for FNT to convert the farm to organic production and establish a natural animal hospital in conjunction with the sanctuary. Because of difficulties with the executors of the estate, particularly their objection to the publication of the magazines from the farm, this was not achieved. When FNT had successfully restored their ailing cows to productive lives again by fasting and herbal treatments, their owners often asked him for advice on their own health problems. He decided to put his extensive knowledge of medicinal herbs to further use by qualifying as a medical herbalist in the human field. He became a member of the National Institute of Medical Herbalists and was later made a Fellow for his work as editor and publisher of their magazine. He had become a consulting medical herbalist for the Society of Herbalists in London and, when the Ferne Farm animal hospital project did not materialise, he decided to give up farming to focus on the other ventures. The pedigree Jersey herd was auctioned in 1958 and the family moved to Letchworth Garden City in Hertfordshire where FNT established a practice and their two younger sons, Giles and Adam, could attend the vegetarian St Christopher School. The transition from soil and animal health to human health was entering a new phase.